Pitches 11 Strikeouts for World Series Game One Win. His bio on Twitter says just one thing: Colossians 3:23. Kershaw helped propel the Dodgers to a 3-to-1 victory by striking out 11 batters. Up till now, he's earned some big awards: three Cy Young Awards, five ERA crowns, three strikeout titles, a seven-time All-Star who's also won an MVP trophy and thrown a no-hitter. But he had never been to the World Series—until now. 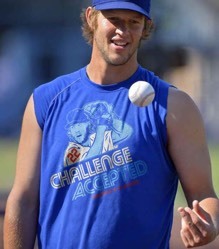 Kershaw's solid faith in Jesus Christ has grounded him throughout an incredibly successful career. "Jesus is the only true way to Heaven," he said in a recent interview. "I started really believing and understanding what it meant to be a follower of Jesus when I was probably in high school sometime," Kershaw said. "From there, just trying to draw on my faith since then." His bio on Twitter says just one thing: Colossians 3:23. In case you were wondering, that verse states: "Whatever you do, work at it with all your heart, as working for the Lord." It's that all-consuming faith that compels Kershaw to use his platform to be a witness for the Gospel. Before the opening game Tuesday, Kershaw was keeping his big opportunity in perspective. "Who knows how many times I'm going to get to go to the World Series? I know more than anybody how hard it is to get there. So, I'm definitely not taking this one for granted," he said. At just 29 years old, Kershaw seems destined for the Baseball Hall of Fame. Before the World Series, he was 144-64 with a 2.36 ERA overall after going 18-4 with a 2.31 ERA this year.